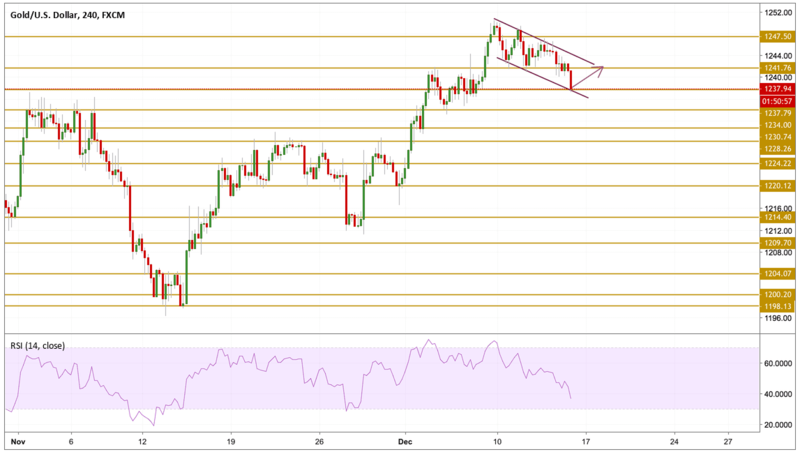 The yellow metal's price action has become somewhat muted after failing to stick to one direction as traders await the biggest closing event of the year, the Federal Reserve meeting. Even though prices are moving lower, a rush of dovish signals from central bank speakers over the past two weeks have lowered the chances of a fourth rate hike this year which limits the downside for the precious metal. On the other hand, easing tensions between the US and China seems to be shaping a positive outlook on future negotiations after China has made the first big soybean purchase since truce was called. Gold seems to have created a bull flag as we can see on the chart that points towards the uptrend continuation. Prices are hovering just above the lower band supported by the $1237.79 level. However after a sharp decline in the momentum, we believe that the continuation pattern is still intact and that price will be back up to test the upper band that is why we will be focusing on the $1241.76 level.